2012: August- Gone Canoe Tripping! 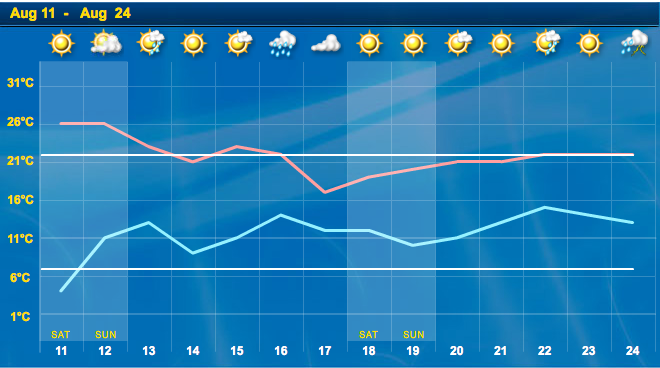 And here is the weather forecast for the next two weeks. It doesn’t look like fire will be a major concern this summer, a nice change from last summer’s smoke over Wabakimi! If you want to see how we’re doing, then the GPS beacon we are taking along will provide an up-to-the-minute record of our location each day. Click on this link to true_north_spot to see where we currently are. (While it is on, the SPOT Connect sends a signal up to a satellite constellation every ten minutes which then relays it to the company server; from there the information is posted on the web site. More info on the gadget can be found here.) Along with the tracking feature, we also make use of the message-sending capability of the device when paired with my Apple iPod Touch. It is able to relay up to 45-character messages to email addresses that have been pre- entered into the device. One weakness of the device is that the “communication” is one-way; it cannot receive messages. I recently learned that such a device, the Delorme Inreach, is now on the market. With each passing year new toys and gear to consider! Talking about new toys, we are taking our new kevlar/carbon Swift Dumoine canoe on its first adventure. The 42-pound canoe replaces the 60-pound kevlar/fiberglass North Bay canoe that served us well on five previous canoe trips. We’ve come a long way from our first canoe- an indestructible 17′ Grumman “Lightweight” aluminum canoe which, although it also weighed 60 lbs., moved like a barge and was notorious for hanging on rocks in the rapids. Whoever is carrying the new canoe on the portage trail should notice the difference! We’ll both notice the difference in the water. Day 10: to take out on access road to Highway 527 21 km. Linable stretches may end up being more work than expected. We have eleven days to do the trip; we have arranged a transfer from the take-out spot up to Armstrong Station some 30 kilometers away on the eleventh night of the trip. The train passes through Armstrong the next morning on its way back to Toronto. We’ll be on it! We’re back and had a great time paddling some of the most dramatic riverscape we’ve seen in over thirty years of canoeing northern Ontario. Needless to say, things didn’t unfold quite like they were supposed to. Click here for the details! This entry was posted in wilderness canoe tripping and tagged 2012 Kopka River trip, adventure travel, Allanwater Bridge Lodge, Antler Lake, Armstrong Station, Brightsand River, Bukemiga Lake, canoe trip plans, canoe tripping, canoeing northwestern Ontario, Harmon Lake canoeing, Kashishibog River, Kopka River, Kopka River Highway 527, Kopka River trip report, Redsand Lake portage, Sandison Lake, Seiss lake, SPOT Connect, Swift Dumoine canoe, Uneven Lake, Wabakimi canoeing, Waterhouse lake. Bookmark the permalink. 16 Responses to 2012: August- Gone Canoe Tripping! Ken, thanks again for that map set of the part of our trip from the Graham Road to the take-out point on the Lake Bukemiga Road. We made frequent reference to the camp sites, portage locations and rapid info that the maps provided. We did the trip over 10 1/2 days; the Kopka gorge section is without a doubt the most stunning bit of Ontario water and rock that we have ever paddled through- kinda like Thunder House Falls on the Missinaibi River but spread out over three falls instead of one massive one. I’ll start pulling together pix and other stuff for a trip report one of these days. Right now I think I’ll go back to your website for potential rivers to focus on for our next paddle trip! Looking forward to your trip report and pictures, as I am considering the Kopka along with Wabakimi in general. I’m curious to learn whether this was your favourite among your Wabakimi trips. I’d really hate to have to pick one over the other. Certainly there was more drama this time- the Seven Sisters section of the Kopka is one big wow. But then again, seeing the Beckwith cabins or paddling down the Flindt or Allanwater Rivers was a real buzz too. No matter what you pick you can’t go wrong and there is always next year to try another direction. FWIW my brother and I are considering the possibility of doing the Kopka again next summer- but starting near Collins this time, coming into the Kopka via Aldridge Lake and then paddling back up to Collins via the Collins River, which seems to start at the top of Lake Bukemiga. I haven’t really done any research yet or looked at topos! I’d be happy to pass on my maps if you make a choice. Let me know. Paul, when I dig up the maps we can set up a way of getting them to you! The maps are the ones that Laurence Mills prepares on laminated 8″x11″ sheets. Our trip report also had some extra detail. We did the longer version from Allan Water Bridge. Francesco – four days is not a lot of time! The easiest way to do it in four days would be with a bush plane drop off somewhere on Kenakskaniss Lake. You would then have four days to get back to the access road to Highway 527 on Lake Bukemiga. Mattice Lake Outfitters do the plane ride and the shuttle back to your vehicle you would need at the end of the trip. Or they could get your vehicle down to the end point and you could drive home from there. They provide excellent service. Cost per plane – I am guessing about $900.! plus $100. for the shuttle. Day One: Drive to the end point- the trailer park at the end of the Bukemiga Acesss Road. Talk to someone there about parking your vehicle(s) for a few days. Given that the trailer park is apparently illegal, it would seem unlikely that they would make a big fuss. Maybe a $50. service fee would smooth things over! Then paddle the 18 km. to the campsite just beiow Goat Portage and the last of the Seven Sisters falls and camp there. Day Two: The next morning do the Goat Portage into the beautiful lake above. The better shape your crew is in – and the more experience you have with portages – the easier it will be. Having a light canoe also takes some of the sting out of it. Our Swift kevlar weighs 42 lbs. Set up camp at the campsite we used. There is room there for multiple tents. After you have recovered from the portage, do a little trip up to the next little lake with the empty canoe and your camera gear so you can see the other waterfalls. Then come back to your tents and enjoy the evening on your lake. Day Three: Spend the morning paddling around the little lake and enjoying the views. In the afternoon – do the Goat Portage. It will be way easier going down! Camp at the same spot you camped on Day One or keep on going a bit. We camped at the start of the portage from Wigwasan lake to Bukemiga Lake. Day Four: Paddle back to the car and drive home. If you have a fifth day you could spend an extra day going up the Kopka and seeing the rest of the waterfalls. I hope this helps. It will make a memorable getaway. I did have one more quick question: would you happen to have a .gpx file of your route? or perhaps know where I could get one? Ken, thanks for picking up the ball! I should have remembered that you had a gpx file available as a part of your Kopka package! BTW any gpx file in the planning stages for this summer? Francesco, sound like a great five-day trip. Is the shuttle is a road shuttle? I remember a logging road crossing the river somewhere in the neighbourhood of Sandison. See Ken’s comment for the link to his gpx file. I assume you have already downloaded his 1:50000 topo set? It was his excellent annotated maps that we used to do our trip. Its a road shuttle yes. Two things guys. WOW what a set of maps you make, and fantastic .gpx also! Super impressed. Not to mention the videos of you running a few of the rapids…talk about advanced reconnaissance! Francesco, no credit to my bro and I for either the great maps or the crazy rapids running. That would be entirely Ken’s doing! He and his buddy seem to go a bit beyond the C II that we take on! true_north – Been working in collaboration with OMNRF and secured a research permit to complete portage trail and campsite maintenance, along with ground-truthing of the historic canoe route along the Mooseland/Gull River system, just south of the Kopka. This will be my third time down this phenomenal and thrilling whitewater canoe route. We depart July 11 and will be out for about 5 days, starting at Hwy 811 crossing of the Mooseland River. There are some rigorous and lengthy portages we intend to traverse, clear and mark so as to access additional lengthy rapids so as to satisfy my thirst for whitewater canoeing. 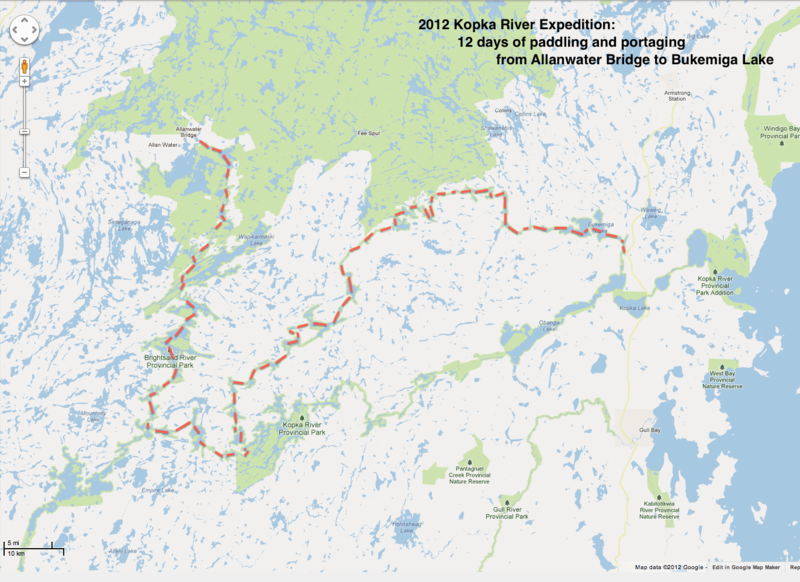 Details of my 2011 venture down this river system are posted online at http://kokanie.ca/gull-river-canoe-route and a short video of the 2014 expedition is at http://kokanie.ca/gull2014. As part of our proposal to the OMNRF, we will be producing a detailed report of our findings and maintenance activities, including standardized ratings of portage difficulty, rapid difficulty and campsite conditions. We expect our work, through the research permit and final report, to be added to the provincial NRVIS system, and as such, form a part of future Park Management Planning activities. Needless to say, we are pretty excited. Ken, now I’ll have to check out your Gull River report – and add it to our list of possible future trips! We eventually do all your trips! And thanks for the work on rehabilitating the portages to make the route that much more do-able by the rest of us. Definitely appreciated.